While there's still a lot of ambiguity about how the rules should be interpreted and how they'll be enforced, the heavy fines for noncompliance (up to 4% of global revenue or €20 million - whichever is higher) has many companies scrambling to comply - particularly those that use third party analytics services on their websites (i.e. almost every company with a website). Despite analytics vendors doing what they can to help ensure that their customers are compliant (such as building in features to anonymize data), marketers are ultimately accountable for how they collect, process, and manage their customers' data. There's a certain amount of risk that comes with that, and a growing to-do list to ensure compliance. There does exist one category of "analytics" that's GDPR-proof, though: predictive models of human behavior. Here at EyeQuant, we use AI to predict (based on past user research data) which content will be most and least eye-catching in a design, whether or not the design is too cluttered, whether people will find a design exciting or calming, etc. This means you can get actionable insights (and, yes, heatmaps) without collecting any sensitive data. Not only is this much less invasive than traditional analytics, it comes without the data protection headache of other insights tools, and won't add to your risk or workload around GDPR compliance. 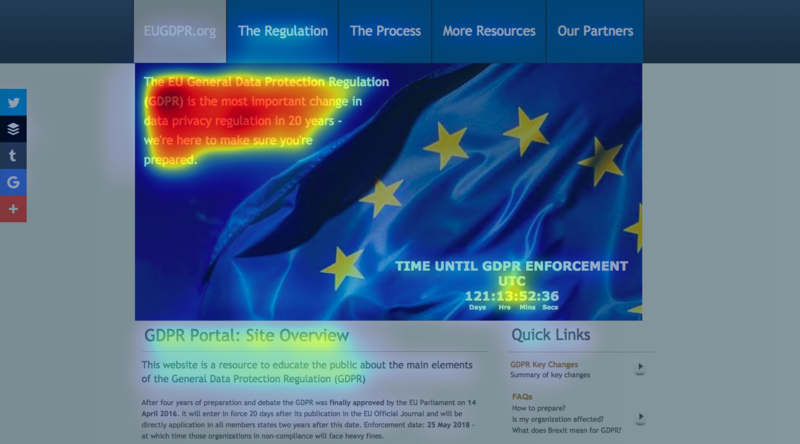 This result was based on an analysis of the specific visual features of the design itself, and is about 85% as accurate as a 50-person eye tracking study, yet it didn't require any sensitive data to be collected from the EUGDPR.ORG website's users. We can also see that the page has a Visual Clarity Score of 69, and and Visual Excitingness Score of 67 - both on a 100-point scale, which can be used to benchmark and compare different pages. Recently, organizations like the EU Parliament, Sephora, Newell Brands, and Merck have begun incorporating this style of analytics into their tool set. Want to learn more about EyeQuant? Request a demo today!